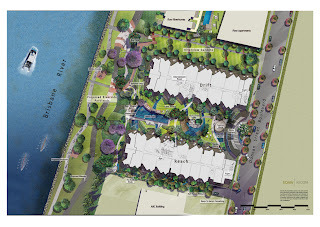 Pradella's Water End development (Stage 1) at West End has been released. Pricing is aggressive. 1 bedroom (Apartment Type G - 61 sqm internal). High floors will likely have river views. Most of these sold out on the first day of pre-release. To get a river view, I think you need to pay at least $835,000 for this style apartment. Plans below. Click on plan to enlarge. As you can see, one bedroom really has no windows. $1,055,000 to $1,295,000. Not all of these will have a river view. Facing North, and in the centre of the complex with a pool view and some higher floors will have a river view. There are other 2 bedroom layouts, and facing different directions.